Don't you hate it when you leave things to the last minute? I tend to do that more often than I should. 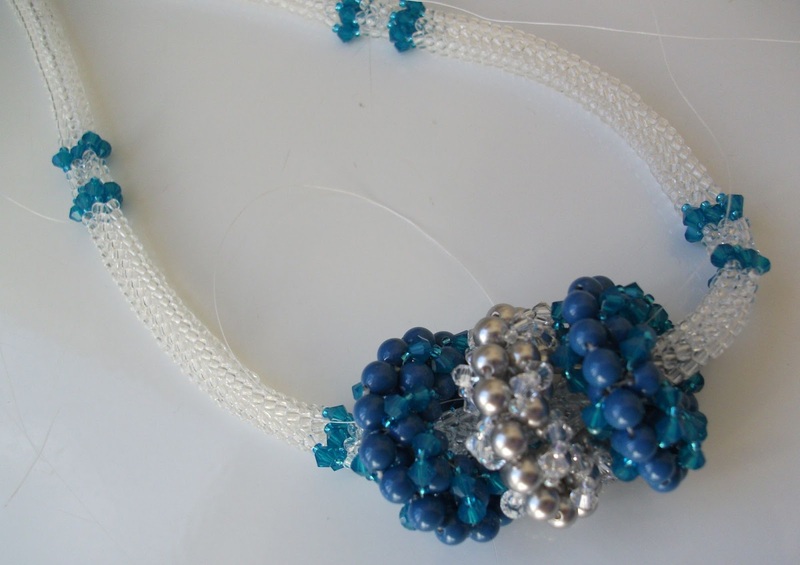 For the 26th Designer Quest, organised through the Beading Forum and sponsored by Eureka Beads, I had my design in mind for some time. I collected a few extra supplies, as you do whenever a new project presents itself. 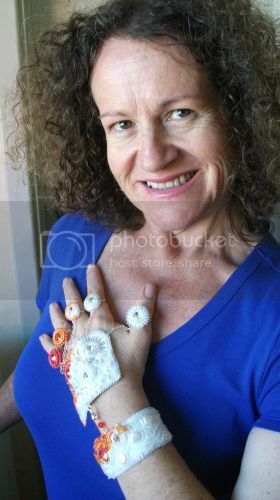 But when I pulled the lovely kit together with my supplies and idea, well, it just didn't work. The big ceramic beads were simply too big for me to pull it off. I lumped all the kit beads on the centre of my working area and played and moved and tried to think. Finally I came up with one design, but realised I had no matching crimps. Another visit to the bead shop was required. I sat down on Friday night to make up the first necklace and force my hand to design something with the remaining beads, but the crimps had been left out of my bead shopping bag and weren't even on the receipt. 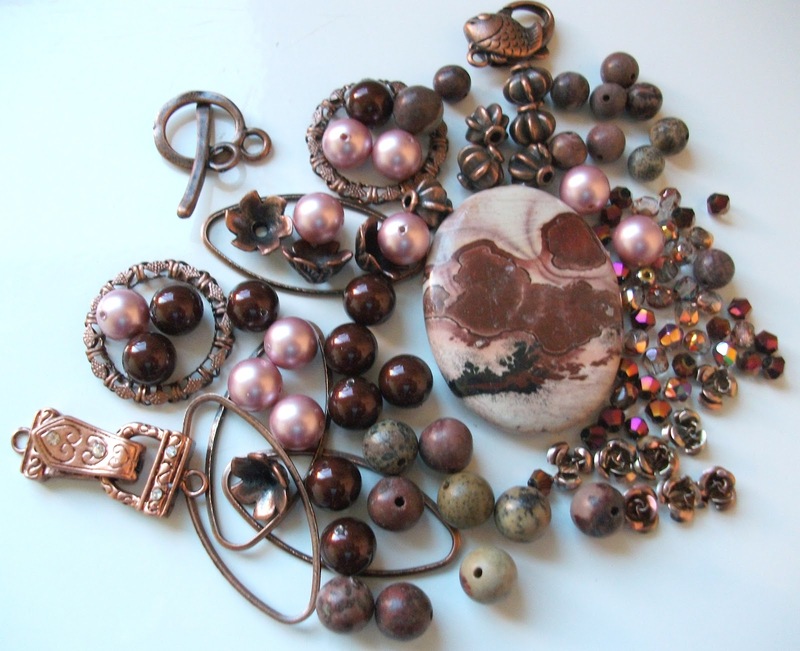 Saturday meant another visit to the bead shop, where I actually only purchased the brass toned crimps. I was amazed, too. After lunch I kind of fiddled and faddled and came up with the second design. It doesn't actually sit quite right, but hubby and son didn't notice, so it was good enough. I snapped photos on top of the washing machine and got them posted to the competition thread. Big sigh of relief. 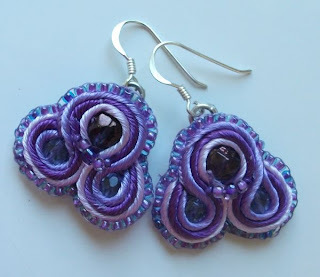 I've been busy beading away at several projects for the Beading Babes Facebook group. There were four choices this time. I worked on three of them. First I made the Enchanted Rivoli Earrings by Csilla Csirmaz. I went with these colours because of the choice of size 9 seed beads I could get my hands on and the possible matching rivoli crystals I already had in my stash. I spent the least on these earrings simply because I have loads of purple beads in said stash. Below is my version of the pattern. 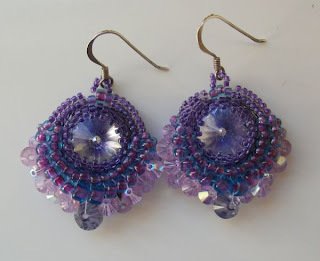 I loved making these and am considering making a pair without the rivoli, perhaps dangling a drop and letting the herringbone weave rope hang in more of an oval. These were super quick to make, too. I've worn them almost every day since finishing them. 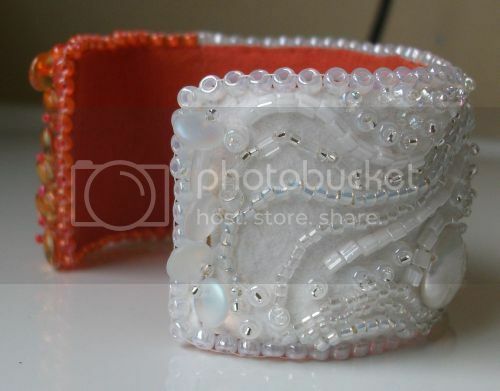 The next project I tackled was the Scalloped Pearl bracelet by Angelle Procopio. 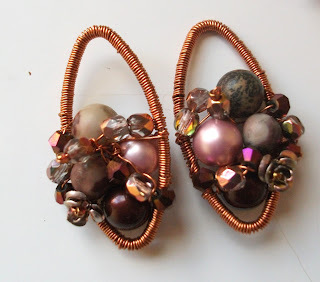 This was fun and easy to make, so much so I made two, although I didn't end up finding any suitable clasps in my stash. 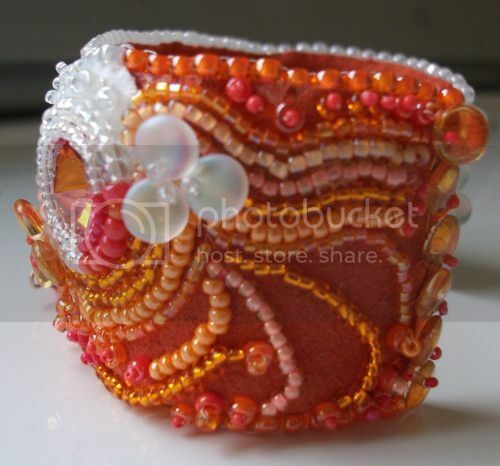 The bracelets are pictured below. 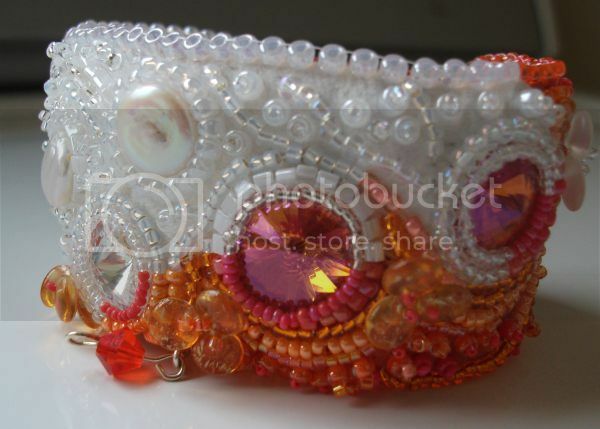 I have clasps on the way, so I'll share the bracelets again once they're complete. So, yes. those are the threads I haven't sewn in yet you can see in the photo. 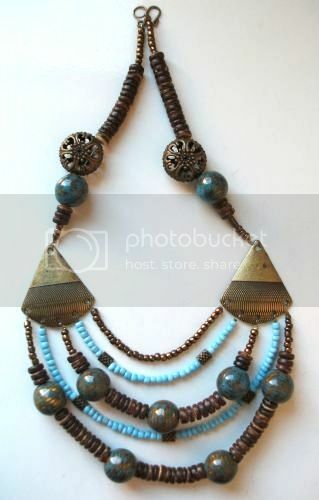 I loved the look of the roller Beads necklace by Cathy Lampole, but with summer on the horizon here in Australia decided to go with a fresher look. The Swarovski crystals and pearls were on special at Fusion Beads, so I managed to get a good deal. 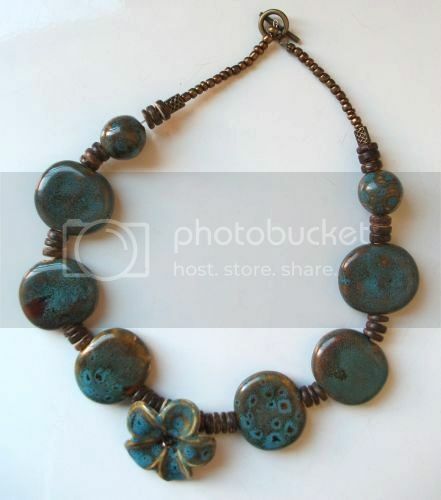 The roller beads are really easy to make, so a beginner would really enjoy making them. 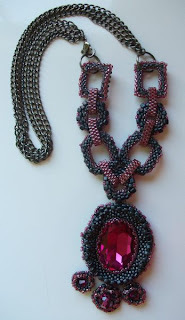 I ran out of seed beads for the rope necklace, but managed to get more from Cranberry. 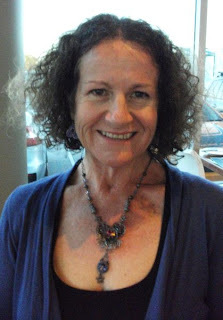 But with some family problems having to take top billing around here I didn't manage to complete the necklace, either. But it's not far off finished. 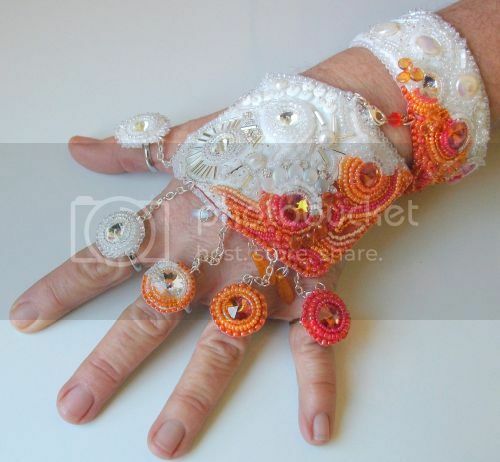 This will also need a clasp. I'm planning on a silver one already in my stash. 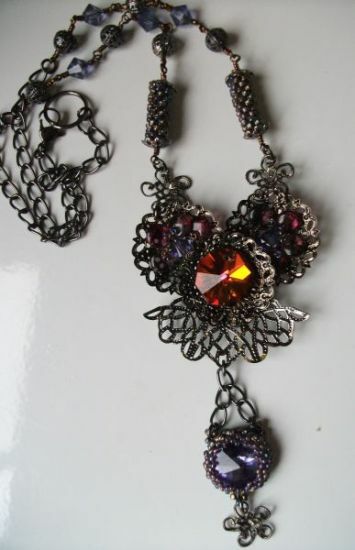 The unfinished necklace is pictured below. I hope you enjoy checking out what I did with the given projects. I'm keen to see what the others in the group have created on their blogs. 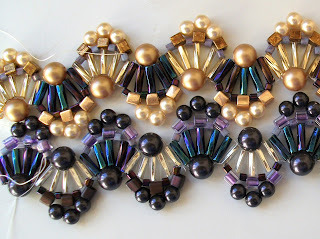 I'm also looking forward to the next round of beading coming up in project 8. Perhaps you could join in, too. While I haven't been blogging much I have been beading much. Ok, bad grammar, I know, but I have been keeping busy with one thing and another. One of my favourite beading challenges is the Australian Beading Forum's Designer Quest. This most recent one was sponsored by Chicky Babes, with two gorgeous packs to choose from. 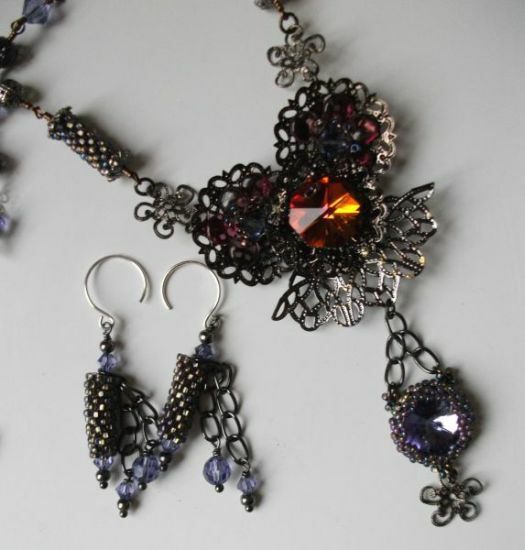 Of course, I chose the tanzanite and gunmetal one. Here's what I made, in the photos below. I only added a little and used everything, but about half of the seed beads. I love the vintage flavour this has. And a not so great shot of me wearing the design. 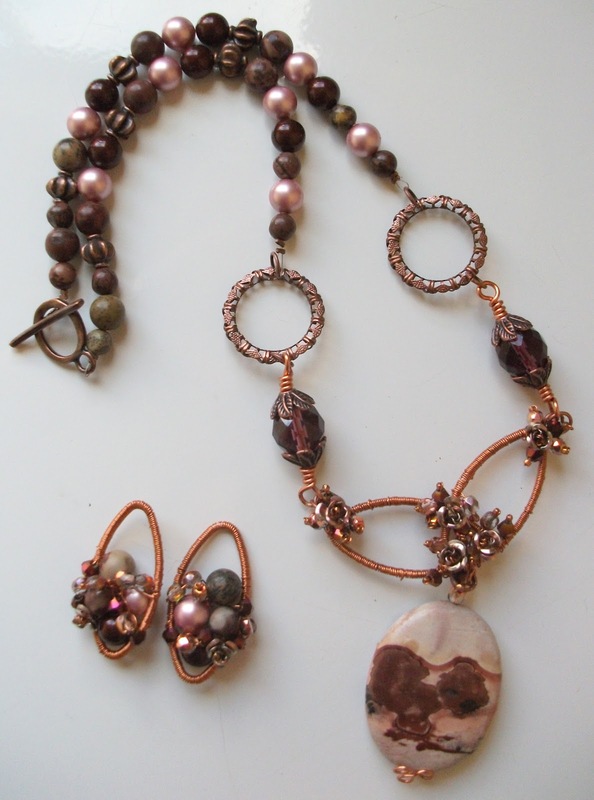 I've been meaning to share this piece since I was able to reveal it, but life has conspired to keep me too busy. Anyway, I created this piece for the Fire & Ice challenge on the Australian Beading Forum. Although, my design was not a winner in the challenge I'm still totally thrilled with how it turned out. I hope you enjoy seeing it, too.